A new function room, which will feature everything from community cinema nights to live music gigs, has opened at a busy Staffordshire Moorlands pub. 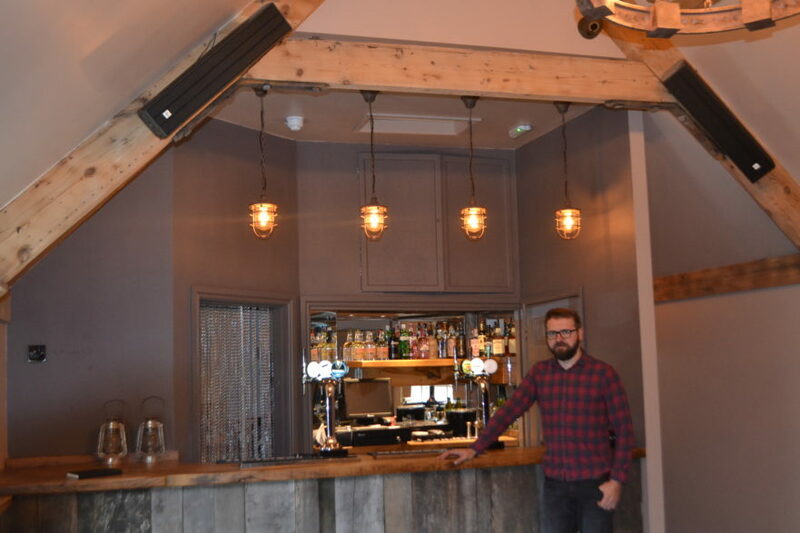 The oak beamed function room is the latest addition to facilities at the Bulls Head, Alton, and signals the completion of a 30-month labour of love for Alton resident James Miller & his business partners. The function room can cater for 50 diners for a wedding breakfast or around 120 guests at a gig or party. Now music enthusiast James is keen to hear from bands and is asking up and coming musicians to send a link of them playing on YouTube. “As someone who has played in locally based bands, I know that there is a lack of venues in the area and it can be frustrating,” said James. “Our function room has a high ceiling and we have invested in a top class PA system, so the acoustics are amazing. We are attracting international touring stars, such as Grammy nominated country artist Will Hoge, for ticketed concerts, but we are also very keen to hear from talented local musicians. We bought the Bulls Head in early 2016 and began an extensive revamp to transform the 17th Century inn from a derelict shell to a thriving pub. The function room is the third and final phase of the project, following the phased opening of the pub and a restaurant. The new space includes a well-stocked bar and the oak beams and spectacular chandeliers give the space the look and feel of a Baronial banqueting hall. Added James: “The Bulls Head was the popular village local as I grew up but, in common with many pubs, it fell into disrepair. “We have created a cosy local and then added more features, working hard to transform the Bulls Head into a meeting place for residents of Alton and surrounding villages. Our extensive selection of beers and spirits attract a good crowd to the bar and we added to this when we opened our restaurant in spring 2018. To enquire about booking the Bulls Head function room, please call 01538 702307, website www.thebullsheadalton.com.